Others are not so fortunate or wise. The memory of the early drinking, and the euphoria, is strong in their brain. They want to experience that again, so they continue to drink. If they keep drinking in a way that causes problems, we call this Problem Drinking or Harmful Drinking. 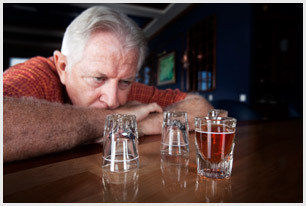 Problem drinking is drinking that causes harm – to the drinker or to other people. On the map, is it possible to reverse up the road and to get back to where one was before? It is possible, but not easy. 50% of drink problems occur to people who are not addicted. Many falls, rows, missed work headaches and other alcohol-related problems are caused by excessive drinking, not addiction. If we want to prevent alcohol-related harm we must pay attention to these problems, and try to prevent them. We cannot focus only on addiction.